Although scholarship has addressed issues around serving international students in U.S. and Canadian libraries, reports on how Chinese graduate students use information in Chinese universities, especially for a particular discipline, are rare. In this study, the author interviewed 15 graduate students and researchers in a top-ranked chemistry program in Beijing, China, in July 2015. The study focused on six areas: use of print and e-books; use of databases; the status of chemical information instruction; awareness of interlibrary loan and copyright; knowledge of open access and data management; and use of reference management tools. Findings from the study will benefit both chemistry and science librarians who work with international students in chemistry and related areas from China, as many of the graduate students interviewed will pursue a postdoctoral experience in the U.S. When the author was a graduate student of chemistry at a research university in China in the early 2000s, a literature search usually began in the print volumes of Chemical Abstracts Formula Indexes. Spectra were found in handbooks stored in the attic of the chemistry library, which was located in the chemistry building, but not run by a librarian. As a result, literature searches were not always efficient. Since I became a science librarian in the United States, I have given an orientation session to new graduate students of the Chemistry Department every fall. Students from China already seemed familiar with special databases for chemistry, such as SciFinder and CSD (Cambridge Structural Database), so I expected that current generation of students would explore chemical literature in dramatically different ways. In order to understand the context of chemical information usage and education in China, and to better serve the needs of international students and researchers at work, I conducted a study at a research university in Beijing, China in July, 2015. Several articles have explored Chinese graduate students' perception of academic libraries in Canada and the United States. In a case study from the University of Alberta, nine graduate students from China were interviewed based on the ACRL (Association of College and Research Libraries) Standards (Morrissey and Given 2006). This study reported details on the students' English language skills, previous library experience, and their achievement in information literacy skills. In another user study at the University of Windsor in Canada, 12 Chinese graduate students from different majors were interviewed about the challenges they faced, such as language and cultural barriers, awareness of library services, and ethical information use (Liu and Winn 2009). A third study surveyed 83 Chinese students and scholars after they returned from studying at universities in the United States, measuring their satisfaction with the academic library services they received and the resources they used (Shao et al. 2013). These studies provided insights about the student groups' information retrieval needs and suggested thoughtful ways to improve services from academic libraries in North America. Information retrieval behavior at the graduate level is highly subject-specific. A study conducted at the University of Oklahoma focused on 31 Chinese engineering graduate students (Chen and Brown 2012). The report concluded that their language proficiency and previous library experience in China influenced their use of American academic libraries. These studies mainly observed the library use behaviors of Chinese graduate students in the environment of North American academic libraries, from the point of view of North American academic librarians. Chinese and North American academic libraries play different roles in students' academic success, and it is expected that students will have different perceptions about or expectations from libraries or librarians in these two distinct environments. Observations by a North American academic librarian will help identify typical information retrieval behavior in China, and challenges students will face when they are in the North American academic library environment. There have been few reports on the information-seeking behavior of Chinese graduate students in Chinese universities conducted by North American academic librarians. Almost 30 years have passed since the last report on chemical information activities and instruction in Chinese research institutions was published in 1987, by a chemistry professor from Eastern Michigan University (Ramsay 1987). In that report, the author stayed for four months in China in 1986 and gave lectures on the Division of Chemical Information (CINF) of the American Chemical Society, Chemical Abstracts Services, DIALOG Information Services, and other database software publishers. With the enormous changes in technology and information retrieval behavior, an update of this knowledge will be valuable to chemistry subject librarians, particularly with increased numbers of international students from China who are studying chemistry in the United States. The current study was conducted in the chemistry department of a leading research university in Beijing, China in July 2015. (Out of concern for the anonymity of the individuals interviewed, the university is not named here.) Because of the program's reputation, the graduate students come from different major universities throughout China. Their undergraduate majors included chemistry, molecular biology, plant pathology, material science, pharmaceutical engineering, polymer science, and pharmacology. There are about 100 faculty members in the department, which admits about 140 undergraduate students (for a four-year program) and 100 PhD students (for a five-year program) each year. The author gave a presentation to a group of 12 graduate students about the role and duties of a subject/reference librarian in an academic library in the United States: collection development, software support, reference, teaching, and liaison activities. Chinese students generally are not familiar with the services provided by subject librarians. One-on-one interviews were conducted with 15 interviewees in total: 14 graduate students and one postdoctoral researcher. Interviewees were recruited with the assistance of a faculty member from the department. The number of students interviewed was limited by the author's length of visit at the university. Among the graduate students, five were first-year, four were second-year, three were third-year, and two were fourth-year. Only one interviewee had experience with libraries overseas (from a two-year exchange program in the U.S.). Most of the interviewees had attended the presentation. Due to time constraints, interviewees were mainly from areas of electrochemistry and bioanalytical chemistry. The author was not able to talk with researchers from areas such as organic and physical chemistry. Furthermore, the author did not have the opportunity to meet any library professionals in the university library to gather their point of view. How do you find e-books/print books for your research? What databases do you use to find journal articles? What do you do when you find articles you need but the university library does not provide full text access? Have you taken any chemical information literacy course as an undergraduate or graduate student? What is your opinion on open access and data management plans? Do you use any reference management tools? Most students claimed they did not use books as often as journal articles, and they used books mainly to find background/introductory information on a research area, usually based on recommendations from advisors or senior lab-mates. Surprisingly, only two interviewees read mostly e-books compared to print books. Three users seldom or never read academic e-books. Reasons that discouraged them from using e-books included readability, high prices and difficulty locating them. On the other hand, e-books were valued because of the ease of printing out desired chapters and using images in slide presentations. Except for one interviewee, all had used print books from the library based on recommendations or browsing by subject classifications. But more than half of the e-book users (7 out of 12 or 58%) said they never used e-books from the library. Instead they found e-books from Baidu Wenku (wenku.baidu.com; a Chinese online document sharing platform hosted by the Chinese web services company Baidu) and Google Books, or received them free from friends/classmates. This aligns with findings from Zhejiang University, another major research university in China. In that study, 440 questionnaire responses were collected from undergraduate and graduate students of various majors, concluding that users showed "high awareness but rather low usage and acceptance of e-books" (Wang and Bai 2016). For example, science, engineering and agriculture majors counted for 53% of the respondents, but only 3.1% of the respondents had ever used the Royal Society of Chemistry (RSC) e-books. On the other hand, the authors reported that students accessed e-book contents and downloaded e-books through channels such as search engines (79%), data sharing platforms (73%), library web site (44%), and online forums (33%). But in the current study, students used the library web site or online catalog less frequently to find e-books (42% vs. 44%). Each student typically mentioned one to three databases that he or she used most frequently. Names of databases and number of times the database was mentioned are displayed in Figure 1. Google Scholar remained popular even after Google shut down its service in mainland China in 2010 (Acohido 2010). Since then, Google Scholar has been available only through a commercial virtual private network (VPN), which costs about $20 USD per year. Google Scholar was especially preferred when searching for a known reference. Students liked it because it is easy to use, and can be used anytime without any seat limit, but two students pointed out that Google Scholar was used less because of the VPN requirement. Students also reported using a mirror site of Google called Gufensoso ("fans of Google" in Chinese, http://www.gufensoso.com/), which does not require a VPN. SciFinder access was problematic in China at this time, because the unlimited access license had not been implemented during this study and students could not log in whenever needed due to the limited number of available seats. Compared with Google Scholar, several clicks would be required in order to find the desired information in SciFinder. Web of Science is also a popular research tool with its citation/cross-references and Journal Impact Factor features. There were complaints that navigation of results was slow and indexing of online-first publications was not fast enough. But it was a common belief that once students were doing research related to biology/medicine/biochemistry, they should switch to NCBI (National Center for Biotechnology Information)/PubMed, even if they had used SciFinder for synthesis design or Web of Science as undergraduates. Baidu (http://www.baidu.com/, a Chinese search engine) or Baidu Xueshu (Baidu Scholar, http://xueshu.baidu.com/) were used for searches in Chinese. Users were not very satisfied with this dominant Chinese search engine, but admitted it had improved. They used China National Knowledge Infrastructure (CNKI, www.cnki.net/) to find dissertations in Chinese. Ten of the 15 interviewees took mandatory/selective undergraduate chemical information literacy courses. Contents of these courses included Web of Science, ChemDraw, and EndNote. All of these courses were taught by chemistry professors, which mirrors the author's own experience. Nobody mentioned that SciFinder was taught in these courses. But students could barely remember what had been taught, for reasons that included: not paying attention because they did not need to use the skills being taught, or being busy preparing for the GRE (Graduate Record Examinations) tests. Only one student remembered learning Web of Science, because a class presentation was required. Only one interviewee had the experience of attending training webinars provided by database vendors. One student mentioned having had an interaction with a librarian about structure searching in SciFinder while an undergraduate, but the contact was brief due to the ineffectiveness of the answer received. Graduate students did receive library training session notices at the beginning of semesters, but it was too hectic a time to attend those sessions. A study conducted at five major university libraries and five research institute libraries in Beijing found that all of the university libraries provided introductory level information literacy training, while 40% offered research-level skill training (Jabeen et al. 2016). A report issued by the Chinese American Librarians Association (CALA) in 2010 found that less than half (13 of 30) of the top-ranking universities in China offered subject-specific service, and this was still "a new trend of reference service" (Tang and Xia 2010). Findings from this study agree with those from the above two studies: students learned their information-seeking skills from senior classmates/lab-mates or advisors, and they do not interact with or try to seek help from library professionals. In general, the interviewees were satisfied with the availability of journal articles. When asked about what they do to obtain journal articles for which the university does not provide full text access, students said they would choose to ask the author(s) of the paper, ask friends in other universities or overseas for copies, seek help in online forums, or just read the abstracts. Four students mentioned an influential online forum: Xiaomuchong ("small wood worm" in Chinese), a platform for academic and industrial researchers to share ideas and information concerning research, publication, grant applications, graduate school applications and job seeking in chemistry, chemical engineering, math, physics, geology, food and agriculture, energy and information science. Only one student realized that their library could borrow a print copy of a book from other libraries. None of the interviewees knew of obtaining journal articles through interlibrary loan (ILL) service, which is provided by the university's library free of charge. As such, they never thought about seeking help from the library to get full text of journal articles. Academic library consortia (such as the China Academic Library and Information System), and some large libraries (such as the National Library of China and the Chinese Academy of Science library) provide ILL or document delivery services (Yao and Zeng 2012). But there is no published study on the acceptance/user awareness of ILL service in Chinese universities. Six of the 15 interviewees had never heard about open access. 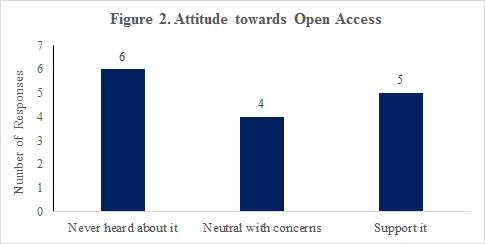 Among those who had, concerns about OA included intellectual property issues, the quality of open access journals, and the cost of publishing open access. Supporters of OA would like their work to be seen by a broader audience, especially when they thought their work was cutting-edge. Only one student had published an open access article. There has been no published research on attitudes toward or awareness of open access publishing among researchers in Chinese universities. A faculty member in the department confirmed that a data management plan (DMP) was not required in research proposals submitted to funding agencies in China. Common practices for managing research data included saving it on hard drives, in lab notebooks, and dissertations. Three students embraced the idea of a DMP, but they were also concerned about the uniformity of shared files' format and the reproducibility of shared data. According to a recent study, institutional repositories in China started late compared with Western countries, and have made slow progress; academic libraries in China were not prepared to implement OA practice (Zhong and Jiang 2016). EndNote was the only reference management tool in use: six out of the 15 interviewees chose it because that was the tool used by other senior lab-mates/classmates. One student mentioned ReadCube as a tool for cross-references. No academic librarian has published a study about the use of reference management tools in Chinese universities. The author interviewed 15 graduate students and postdoctoral researchers one-on-one in a top-ranked chemistry program in Beijing, China. This study provides a glimpse of how graduate students and researchers in China are finding and using chemical information. It was clear from these conversations that students at this level are largely unfamiliar with the services and resources of a modern academic library, and are not prepared or inclined to seek assistance from subject specialist librarians. Many of the graduate students interviewed will come to the U.S. as postdoctoral researchers to advance their careers, since postdoctoral experience overseas is strongly encouraged if an academic career is desired. Findings from this study can be beneficial to chemistry or science librarians who are providing assistance or instruction for them. Since most students interviewed had no experience with library professionals with subject expertise, it is vital for academic librarians to reach out to them and demonstrate the services subject librarians can provide. Interlibrary loan is a particularly unknown service that should be promoted, as are services around open access and data management. 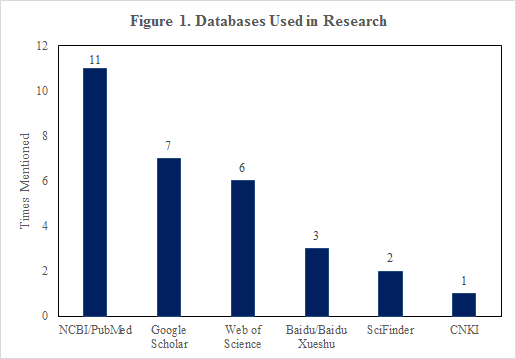 It would be helpful to see more studies from Chinese academic librarians about topics such as use of subject-specific databases, awareness of open access and interlibrary loan, and use of reference management tools in Chinese universities. Studies like these can help academic librarians who work with international students understand Chinese students' previous library experience. The author wishes to thank Dr. Xiaoyun Liu for his assistance in facilitating this study. The author is grateful to all the interviewees who have shared their knowledge and insight. The author also would like to thank Karen Thornton and William Claspy, Research Services Librarians, and Brian Gray, team leader of Research Services, in the Kelvin Smith Library of Case Western Reserve University for their valuable assistance with this manuscript. Morrissey, R. & Given, L.M. 2006. International students and the academic library: A case study. Canadian Journal of Information & Library Sciences 30(3):221-39.